I am Armenian living in Yerevan (capital of Armenia) and Fan of Korean Dramas. Our Country is the 1st Christian country in the world. It is very beautiful, sunny, old & young country. The most beautiful season for Armenia is Autumn. I am became fan of Kdramas after my both daughters advise. The first dramas were King2Hearts, Rooftop Prince, Innocent Man and the Movie Werewolf Boy. 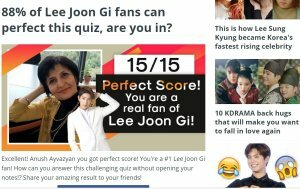 But as I research Lee Joon Gi, he became my The Most Favorite and Lovely Actor and watched all his movies and dramas, and from his list-My Girl was the 1st. After him I watched So Ji Sub's and Jo In Sung's dramas, and for me the Drama of Dramas are What happened in Bali, Autumn tale, Stairway to Heaven, Sad love Story. Why so sad ends? And the Leading Actors are perfect. Later I love Lee Min Ho's Acting. So about my Favorites you can find on my Favorite list. Later after Lee Joon Gi I became Fan for Song Triplets.They are amazing and very cute. Please look at my Favorite list before sending me Friend request. send when our tastes are the same or a little alike. ;) Thanks.